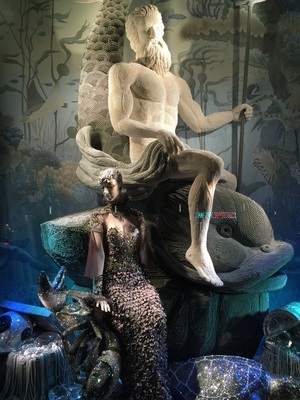 Bloomingdales has commissioned the floral designer Jeff Leatham to create prismatic metal animal sculptures of deer, penguins and other fauna bathed in caves of roses. Most striking is the golden buck, whose ten-point rack of antlers is formed with brass jingle bells. Music accompanies the display, of course, but true to the “Holiday through the Senses” theme the air in front of the window is somehow perfumed with a bayberry scent, reminding us of Christmases past. A window gimmick I have never encountered before! 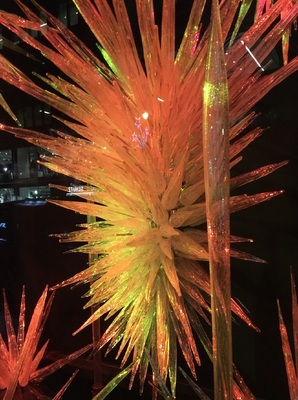 Barney’s seasonal spectacle focuses around ice and its related forms, which is a prevailing theme in New York’s windows this year. (We are seeing a lot of “chilly” windows despite the unseasonably warm weather we have been experiencing—perhaps they were inspired by last year’s brutal winter! )Dale Chihuly iciles WEB Dale Chihuly created a window of crystal icicles growing from a pool of black water. A starburst of these lethal, painted projectiles floats in the center, lit by an old-fashioned kind of Christmas color, which seems to transform retro aluminum holiday trees from yellow to orange to blue and continuing up the spectrum. Perhaps most fascinating is the window that has been rebuilt into a real walk-in freezer. On the steel, riveted and frosted walls hangs a series of sharp tools and saws. Front and center is a sculptor’s table on which stands a large block of ice. Actively carving this chunk of frozen water is a real, live professional ice carver, wielding a chain-saw spurting ice shards all over the window, or, rather, his “studio.” I’ve never seen this gimmick either! Clad in a silver lamé astronaut’s suit, this courageous artist heroically slices away, surrounded by voluptuous ice figures he has already completed. Needless to say this drew huge crowds. 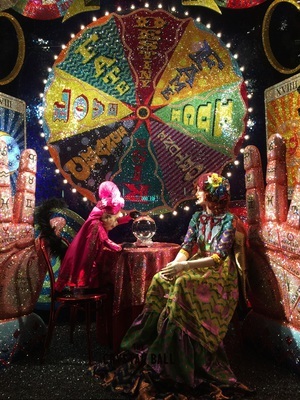 The “Crystal Ball” window, upholstered with jewels from what must be the far reaches of the universe, displays a well-clad fortune teller (who is actually a monkey in disguise) and her dazzlingly dressed client. Flanked by giant hands tattooed with astrological symbols, the pair sit beneath a massive, kaleidoscopic wheel of chance spinning fates of luck, love, fame and fortune. A true tour de force of sparkling color! The whole L&T experience is enhanced by the scaffolding, normally a visual assault to New York eyes, but this year the window wizards cleverly draped the scrawny poles in so much greenery that you feel as if you’re about to purchase a Christmas tree. Adorned with sparkling lights, you are drawn from ten blocks away to view this festive treat. Thematically, ice and icing stole the show in most windows up and down the avenues, with creamy white fur, leather and stretch pants highlighting the season’s fashion. Blocks of igloo-style ice, crystal jewels of ice, frozen waterfalls, snowflakes and iced cupcakes swept the retail windows, bringing bling to the bustling city streets. 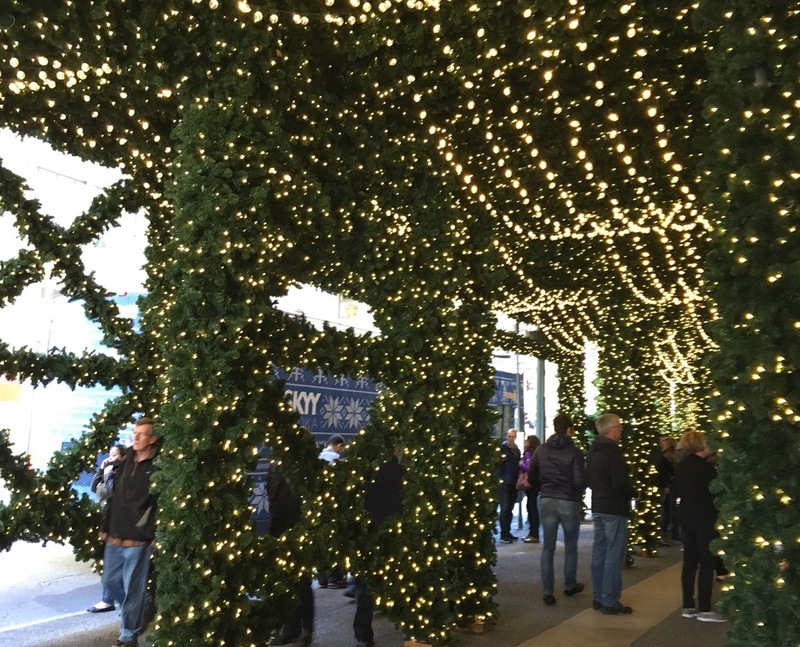 It seems that New York put on the dog this year, elevating their holiday displays to a new level of artfulness and throwing out older themes with even more dazzling displays. Could it be possible to surprise New Yorkers even more this year? Well that seems to be the retail world’s goal this December. I highly recommend this pilgrimage-like perusal, if for no other reason than an inspirational touch of joy. Happy Holidays.